In the last post I was writing about what seems a clear fact that people are keen to set about improving their health in January as you would expect. Using StepWise myself over the past year, it has made me much more aware of the steps I take (or don’t take), and has made me much more self aware and conscious of my health. The integration with HealthKit has made StepWise a great aid for providing insight into not only your daily steps, but also distance walked, speed, calories burned, fat burn and more! I feel that as health and fitness is such an important part of everyones life that it would be good to give something back and make StepWise free. Yes, you heard right, we are making StepWise free! From today, we have removed the charge for downloading StepWise Pedometer. This is not some cut down version, but is the full StepWise. Not only giving steps, distance, percentage goal, active time, speed, calories and fat burn for the day, but providing a separate trip counter, last 7 day data, and history data as well. StepWise also added a Today Widget earlier this year, giving quick access too! We fully intend to add more features moving forwards to help you keep fit. 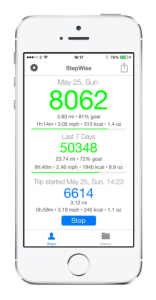 Download StepWise free today, and start tracking and improving your health and fitness.